Call me a commie but I don’t give a crap about baseball… (American) football is the only sport that matters! And now that football season is finally here I’m on the lookout for apps that will make the games even more fun to watch. 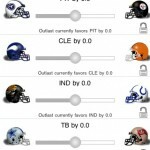 Outlast Football is your basic survival pool where each week you pick ONE team that you’re absolutely sure will win, and if you’re right then you live to see another Sunday (or Monday or occasionally Thursday). If you choose the wrong side of an upset, though, you’re done for the season. The only catch is that you can only pick a team once during the whole season, so after Chicago crushes Green Bay at Lambeau in Week 1 you’ll have to move on to other possible winners in subsequent weeks. 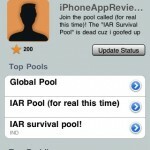 You can make your survival pool public or private and you can also join other public pools if making one pick a week isn’t enough for you. There’s also the option to add a point spread if you’re fully convinced that your team will win by (x) points, and you’ll either get rewarded or penalized in “LastCreds” depending on the outcome. I don’t fully understand the point of LastCreds, aka Outlast points, but I’m guessing it’s just a way of ranking players and their knowledge (or luck) in predicting winners. As for how this app performs in the heat of battle I don’t really know yet since the NFL season hasn’t started, but I guess we’ll find out soon enough! 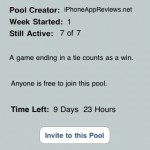 Outlast Football is free, so if you’re a football fan you need to download it and join my public pool! Just go to “Buddies”, click Search in the top left corner, look for “iphone” and you’ll find iPhoneAppReviews.net. Be sure to join the league called “(for real this time)”.